My White Best Friend at the Bunker Theatre. Hi. How are you? I spoke to you earlier today, so I know you’re good. God. There’s so much I want to say about this show. A review is definitely not the right way to talk about it – I’d rather have actual discussions – but maybe this is the best way to respond to it? What do you think? Because I’m really conscious of trying to get this right – whatever that means. When I say right, maybe I mean honest. So let me be honest with you. You’re my white best friend, Connie. We became friends at 16, when we were at school together, when I still had an ugly blunt cut fringe (TERRIBLE for someone with such a square face – why didn’t you tell me?) and you hadn’t started putting blonde highlights in your hair yet. You’ve been there for all of it. Everyone I’ve dated, you’ve vetted, and vice versa. You’ve cooked me countless dinners. I’ve calmed you when your anxiety was at its breathless peak, and you’ve held my hand and waited by my side when my depression has kept me at the bottom of the sea. I can’t even begin to imagine how many Facebook messages we’ve sent each other. Over 100,000, for sure. Rachel De-Lahay’s monologue is read by a white actor each night. Tonight, it was Ines de Clercq. She reminds me a bit of you actually. Do I mean that? Maybe I just mean that you’re both thin white women with pale hair. 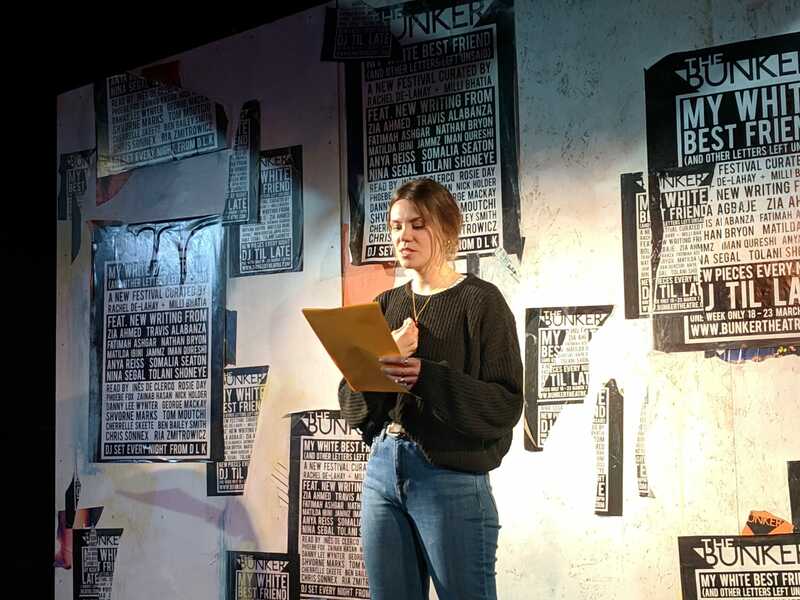 De-Lahay’s monologue is written from the perspective of her Connie, her white best friend – a girl she meets when she moves from Birmingham to London to go to drama school. De-Lahay’s Connie can’t begin to – doesn’t want to – understand the complexities of being friends with someone who’s not white. She doesn’t show up, show out for her black and brown friends. She thinks Black Lives Matters is a bit aggressive. She suddenly seems very small onstage. This description is doing it a disservice. It’s such a striking piece of writing. Like it’s just been pulled out of the gut, steaming and red and alive. It isn’t easy. It just is what it is. That’s the beauty of the festival, I think – that De-Lahay and Milli Bhatia have allowed these pieces to just take up space, to just breathe, for these writers to just say what they want to say. de Clercq visibly squirms onstage – is that her acting or is she genuinely uncomfortable? – lit by this bright white, unforgiving spot. I have been thinking about how to write this letter for hours. I hope I’m doing okay. There are some things I can’t tell you – not because the words won’t come out right, but because you just won’t get it. Maybe that’s not your fault. Maybe it is. I think, Connie, after we left school, that’s when there was a shift. Not a big one, but it was palpable. I was soaked in, surrounded by whiteness at school, and it’s only when I began meeting people who looked more like me and less like you that I realised how suffocating that was. You still don’t quite understand why I look back at our school days with such ambivalence, why I’m always so reluctant to see old school friends now. I don’t think I can really express it to you. Because it was the hunger with which I sought these new friends out – stared into their faces, grasped their hands, felt my voice cracking as all this stuff poured out of me that I’d kept under the lid for so long. I didn’t need to perform something palatable for them. It was just like exhaling. And you and I grew apart a bit – not hugely, but a normal amount, considering we were at different universities. When I did hang out with you and your (white) friends, I’d sit there and feel like my head was popped off my body. Constantly afraid that the party topic would turn and that I’d be forced to explain, to justify my existence, my experience, or that of black and brown people more generally, to have that all up for friendly debate and then leave, exhausted and bruised. I could feel a gulf opening up between us, below the waves, and I know you could feel it too, even if you didn’t quite understand why. I give you far less now, I think, but I don’t know if you notice that I hold back. I don’t think you understand me the way you once did. I don’t talk to you about **race things** because I am constantly, low level afraid of what you might say. Not that you’ve given me reason to doubt you, necessarily. The threat is just always there. This festival isn’t curated for white people, Connie, but I think when it does turn its attention to our white friends, what it says is that allyship isn’t something that is static. It’s a muscle which needs consistently to be stretched and retrained. Jammz’s short lyrical letters, delivered with initially amiable and then satisfyingly sharper edges by Ben Bailey Smith are spikily acute and funny and aggravating. And then Zia Ahmed’s piece, performed by Zainab Hasan, is devastating. It starts as a scathing comment on race and class, that particular intersection that gets skipped over constantly like a scratched vinyl. His piece twists these awful, pathetic Sajid Javid quotes into something even more warped and gross, and then Ahmed’s letter actually begins and it is a bitterly, desperately angry piece about racial profiling. That it is so piercingly, beautifully written is almost beside the point, and yet. I came out of the theatre aching and tired. Even though this is addressed to you, I hope I’m not writing for a white audience. I don’t think I am. I am not trying to make this easy for them to read. And you’ll never read this, I don’t think. I’ll never tell you that I wrote this. Maybe that’s the tragedy. Maybe not. After De-Lahay’s monologue I turned around, slightly shaky. Milli Bhatia, the festival’s director, stood behind me. We saw the expressions on each other’s faces and she gripped onto my arm for a moment. She didn’t need to say anything. It was all there already, laid out between us. There’s a lot more I want to talk about, I think, but I don’t think I want to say it to you. No offence – but it’s just not for your ears. All my love, Connie, even if I don’t really know what that means anymore. My White Best Friend is at Bunker Theatre till 23rd March. More info here.